Last Saturday I went to Jakarta very early in the morning to do an errand. I started from home at 5 am, cos there were no traffic jams...I finished what I had to do in record time, free at 7 : 30... soo happy ! Since I was in The Capital already, it was a shame to waste the opportunity...I headed towards a Huge mall in the heart of Jakarta, in the hopes on finding BYJ's book at a Japanese bookstore outlet there....and to search for SS501's album ... any album of theirs. Of course I got there very early ....and had to wait for almost two hours for the shops to open. Lucky there was a Starbucks there that opens earlier than the rest. Hmm...I had a book with me, so waiting was no problemo. 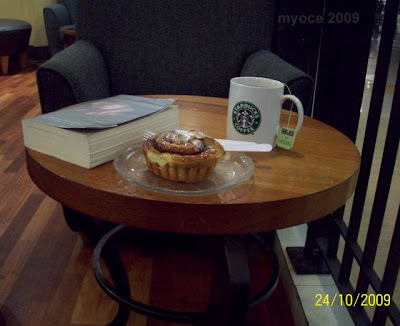 Armed with a delicious and fragrant cinnamon roll and a healthy mug of green tea with my book...I was all set up...I stretched out in a comfy armchair and enjoyed myself. Sadly, after going round and round...I saw no signs of BYJ's book, they recommended another - more complete - store in another mall. Oh well, I was not disappointed cos I really didn't expect to see it here in my country. I'd better wait for the English version and order straight from S.Korea. 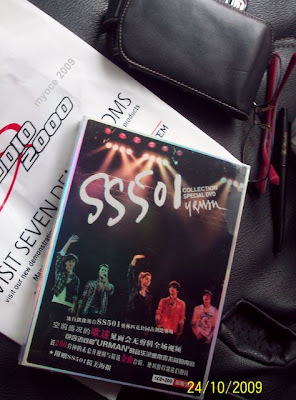 I went home very happy, actually :) yep, I got SS501's URMAN Collection Special DVD..there are three discs and a poster...oh..melchan really jumped up and down squealing when she saw them ^^ !! .... I think it's the Chinese edition. As I said, I was too early at the mall and it had not opened yet. Told my driver to go into the mall's parking lot...planning to wait it out in the car. Got bored... tried walking through a street next to the mall to relieve my boredom....but everything was still closed. By that time I'd walked fairly far ... perspiring....and I couldn't see the Mall anymore...o..O....Ok, better take a Bajaj back [a small public transportation, for one or two person ...more if you all squeeze together on the back seat]. Stopped a Bajaj and got in, my driver would laugh if he could see me! At the entrance to the mall, I had to go through a bag search...and the security officer asked me where I was going..I explained about being early etc...etc..and asked him if I could wait in the building. He told me to go through a side door, and pointed it out to me. I decided to get my book from the car first...went to the carpark in the basement...driver nowhere in sight and the car was locked. Waited till he got back...when he appeared, he said he was not allowed to sit and wait in the car by the car park security, and he was also stopped and questioned by several officers when he went to the restroom. The driver felt they were suspicious of him...I said it's probably the SOP [standard operating procedure] of the security here and not to worry. Hmm... earlier we were also told to cut the engine as soon as we parked [I was still inside gathering my things]. Had my book and headed to the first floor...the security officers in front of the lift asked me where I was headed....I told the same story ..... got in the lift....door open....another security officer was in front of me...asked me the same..I replied the same, asking him where I could wait, he pointed to another lift and said I could ONLY go to Starbucks, as it's the only one open at this hour...I was not allowed to go anywhere else. Well, I must say... I'm very glad about the fact that the security was so strict and they were very careful of admitting people in to the building.....with all the recent bombing incidents and threats, it's very commendable of them. I'm sure it was all routine procedure. Also, they were all polite, strict... but polite. B...u...t....after all that's said and done.....w..w..hy do I still feel like a c...r...i..m...i...n..a..l ???? Oh Myoce, sorry to hear the behind the scene event.. My eyes were poppping out when you said you finished two books by midnight..yikes! reminded me of that week of my holiday..
BTW What do you think of Host? It's Ok, Hyds...I've pour it out in my blog, so now feeling better. 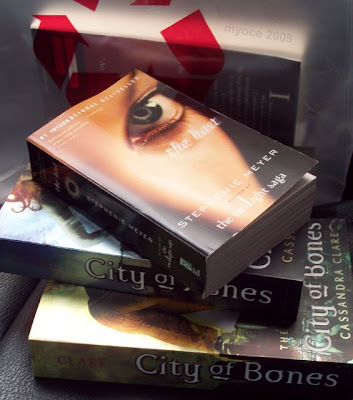 Oh the books were so nice, now I've got to find the third one since it's a trilogy. The DVD I'll watch after I get back also :(...just so harried these days ! Hope both of you are fine.